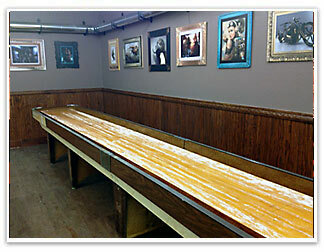 Bob Stephens did a great job on his table refinishing project. 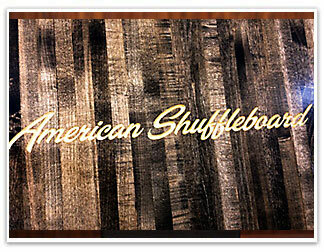 Check out the beautiful American Shuffleboard logo. 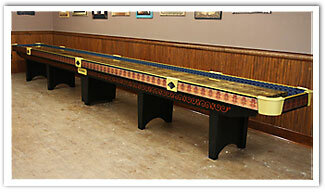 This is my American Shuffleboard table restoration project. 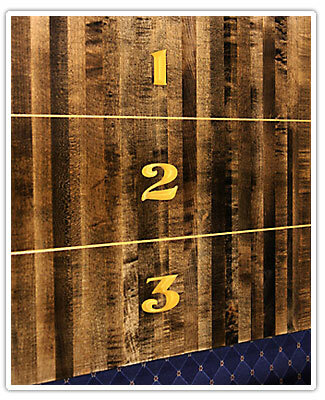 I surface planed the playing surface down to bare wood and removed the old inscribed lines and point numbers. I then stained the surface a dark mahogany, then v-carved the new markings into the surface, painted a brilliant metallic gold, filled level to surface with clear epoxy, and then applied four coats of Minwax urethane. I designed a metal tile pattern that I printed onto a brushed aluminum material and fitted on the bed side rails. 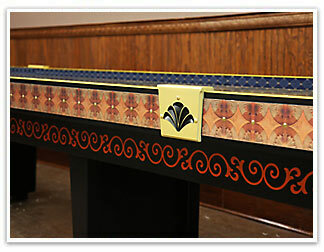 The lower rails are a repeating scroll pattern I painted it a metallic copper. The bed and legs were all refinished in black. 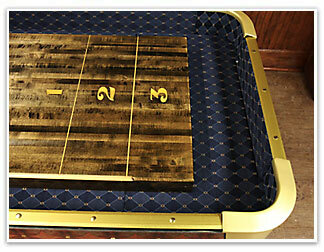 I have new brass leg levelers which I haven’t installed yet, so they aren’t in the photos. 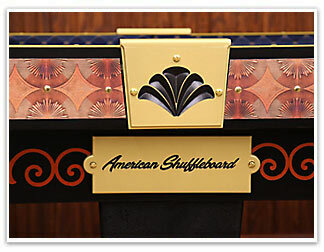 I refinished the outer chrome corner pieces in the same metallic gold and fabricated the seam covers out of solid pvc which I then carved designs into to hide the joints where the two halves of the table come together. For the inner bed, I made and covered panels in a blue fabric with padding underneath. I also added a gold carpet strip to the top edges and used a hundred gazillion brass tacks along the side and top edge for a cosmetic details effect. 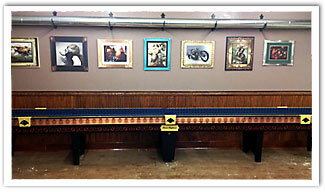 The theme for my man cave is Steampunk so that’s why I went in the design direction I did.